Notes, Saved Cameras, 2D Plan View, the Cross Section Slider, and the Mini Map provide extra perspective into the model's design. Written Notes and Saved Cameras call attention to special features in the design while 2D Plan View, the Cross Section Slider, and the Mini Map give you additional ways to see how a model's floor plan is laid out and how different spaces relate to one another. Numbered Note callouts can display in all types of on-screen views. Tap the View icon and select Notes for a list of all Notes in the model. Click or tap on an item in the Notes list or a callout in the view to open its associated Note. When a Note is opened, the Mode and perspective of the current view will shift to better focus on the Note and its subject in the model. Click or tap anywhere in the view to close the Note again. Turn the display of Note callouts off or on in View , under Notes. To create a Note, double-click or -tap anywhere in the view. The current View Mode and perspective will become associated with the new Note. If you pan, zoom, or rotate the view while a Note is open, you can tap the Reset View icon to update the Note's default view perspective. Click or tap the Edit icon to change Note's text. Click or tap the Delete icon to remove the Note. Models can have saved cameras associated with them. Tap the View icon and select Camera to access a list of any cameras saved with the model. Click or tap on one to activate it. Saved cameras can also be activated in VR Mode: simply look at a round camera hotspot until it activates. 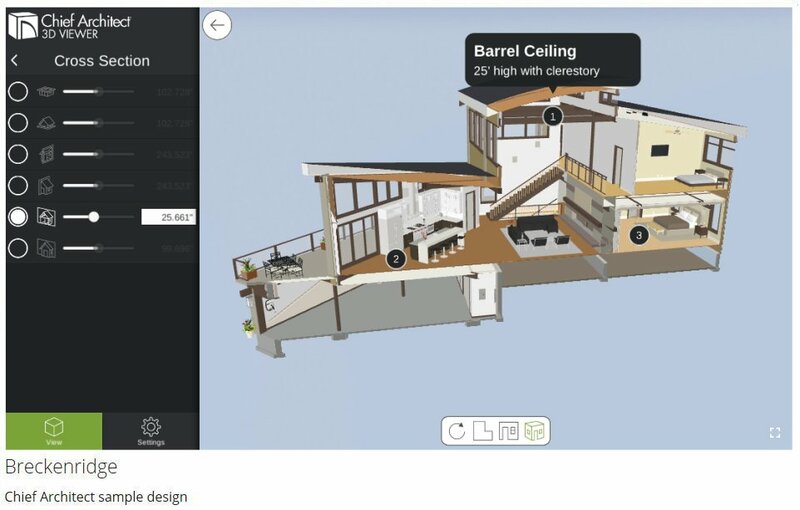 Tap the Plan View icon to enter a top-down view of the model's floor plan. The Cross Section Slider allows you to create customizable section views of the model. Click or tap the View icon and select Cross Section to open the Cross Section Slider panel. Check the box beside a section cutting plane that you would like to use. Use the slider or enter a value in the text field to adjust the position of the section cutting plane in the model. The position is measured from the surface of the model first cut by the plane. Use multiple cutting planes at the same time to create customized sectional views. You can specify whether inches or millimeters are used to describe the cutting plane position in Settings . In Room View, the Mini Map window at the top left corner of the screen shows a 2D Plan View of the model. The camera’s position and direction are represented by a blue arrow, providing a sense of its location within the model. Mouse over and scroll or use the pinch gesture in the Mini-Map to zoom the Plan View in or out. Click or tap once in the Mini-Map to move your camera to that location. When you rotate the camera, the Mini-Map will rotate as well. You can disable this by tapping the Settings button and selecting Views. You can also turn the Mini-Map off and on in Settings .